In 2005, the Channel 4 “Time Team” television show visited Applecross and carried out an investigation on a structure thought to be an Iron Age Broch (a thick-walled, dry stone tower of circular ground plan). As a result of local interest in the site, the Applecross Archaeological Society was formed and, from 2006-2009, a community archaeology project was undertaken to excavate the broch. Annual digs (manned by professionals, members of the North of Scotland Archaeological Society and a team of local community volunteers) have taken place each year (with two excavations in 2007), with the final quadrant excavated in September 2009. Details of the monument record for the broch, a summary of excavations and associated reports are available from the Historic Environment Record. The ALPS project continued the work that had gone before, with a further stage of excavation and study of the broch. The project was managed by a team of archaeologists: Cathy Dagg, Mary Peteranna and Cait McCullagh. The finds made during its excavation were recorded and sent to National Museums Scotland with some being retained at the Applecross Heritage Centre. On the 2nd of October 2010 the Archaeological Society hosted a conference in Applecross where some of the country’s leading authorities on brochs gave presentations about the Applecross broch and the wider Iron Age context. The conference, which attracted over 120 local and visiting delegates, started with a tour of the site by the excavation team before moving to the village hall for talks by Professor Ian Armit, Steven Birch, Dr. Fraser Hunter, Beverley Ballin-Smith, Tanya Romanciewicz and finished with an open discussion chaired by Dr Noel Fojut of Historic Scotland. 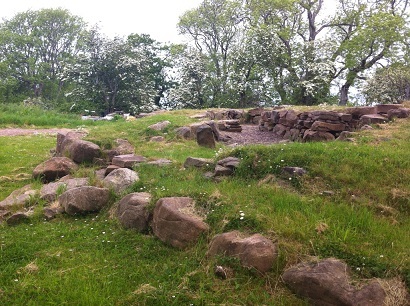 The following two years saw the consolidation of the broch structure, which now has a path around the perimeter, allowing visitors to view the remains. During this time, further excavation works revealed a cist not far from the broch; this has also been covered and all finds recorded.